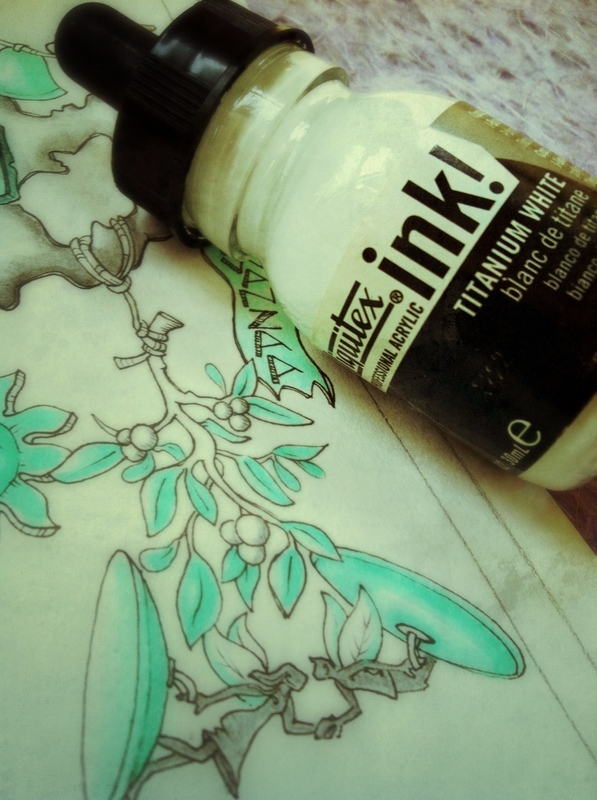 My holiday card is almost ready to print thanks to the Magic Elixir of Liquitex Ink. I wanted to keep this year's card on paper and out of the computer. Without any handy 'undo' function on my pen I've been sort of balancing between enjoying the creation process and bracing for the inevitable mistakes—which just causes more mistakes. I know! After trying and discarding a few other correction solutions I settled on the acrylic ink, forever to be known as the Magic Elixir and restorer of my sanity. The card is drawn on Canson 98lb mix media paper. I transferred my drawing from tracing paper onto the Canson paper with a lightbox and Micron 005 and 02 pens. Next came shading with the General's Sketch and Wash graphite pencil. Love it! The colors were brushed and drawn on with Dr. Ph Martins's concentrated water colors and Caran d'Ache Prismalo I pencils. Pretty. Finally, to the rescue, the Liquitex acrylic ink to correct the few, no really, just a few mistakes. Happily the Micron pens had no complaints when redrawing over the acrylic ink. Even the watercolor didn't look terrible. Hurray, Magic Elixir! I'll reveal the entire card after it's had a chance to reach its destinations around the world. I'm so excited for everyone to see it!